Pergo flooring is laminate flooring. Pergo is simply a brand name of laminate flooring. There are a variety of other manufacturers of laminate flooring that compete with Pergo. Pergo flooring is manufactured to look like hardwood floors, however it’s less expensive to manufacture and it’s easy to install. Pergo laminate flooring is designed so that a moderately skilled DIY homeowner can install it themselves with little effort or tools. Though in most cases Pergo flooring is designed to look like real hardwood floors it can also be constructed to look like nearly any type of material. The reason for this is in its unique construction. Sandwiched in between a high density fiber board base and a hard transparent melamine resin top coat is a graphic image of the material the Pergo laminate flooring is emulating. The high density fiber board is typically about ½ inch thick, and the transparent melamine surface is design to be highly scratch resistant. The weak link, however, with Pergo flooring, is the high density fiber (HDF) board. If it gets wet, the HDF will swell and deform, effectively destroying the Pergo flooring. Pergo flooring planks are available in snap together and glued together installation types. The snap together type is extremely easy to install, however it is more susceptible to moisture damage than the glued together Pergo laminate flooring. 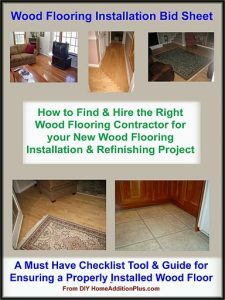 As with any wood base flooring product, Pergo flooring planks should be allowed to acclimate for 48 hours in the room they are to be installed in prior to installation. In addition, the subfloor should be stable, sturdy and smooth. Besides its extremely affordable cost, it is also highly resilient to foot traffic, and family and pet abuse. Consequently it’s ideal for recreation rooms and other high traffic areas. It can also be used in Kitchens, however I highly recommend using it in kitchens where there are few small children and less likelihood of liquid spills. Theoretically Pergo flooring can also be used in mudrooms and bathrooms, however I hesitate to suggest doing so. Only if these types of rooms are expected to see minimal moisture would I agree that using Pergo flooring is acceptable. I would certainly not use it in a basement where moisture levels are notoriously high. Pergo floor maintenance is very easy. Soaps, detergents, cleaners and waxing are not required for cleaning Pergo flooring. A dust mop or light vacuum is typically all that is required to clean it. Its impervious transparent top coat prevents any risk of staining and fading. A lightly damp mop can also be used for cleaning it, as long as a little extra care is given to preventing moisture from standing on it for any length of time. With regards to repairing Pergo flooring, in the rare event the Pergo floor is scratched there are color kits that can be purchased to mask out the scratches.